Rock Lords come in all shapes and sizes, but the ones that garner the most excitement are the ones that are weird. And let's be honest - they turn into rocks, they're all weird! Jawbone and his fellow Fossil Lords are weirder than most though - they are the Rock Lords combiner team! Not a lot of people know that there was a Rock Lords combiner - it was released late in the run, and only in Japan and parts of Europe in limited quantities. While the set was released in Europe as 'Fossilsaurus' it was released in Japan as 'Majin Robo Gattai Saurus' which roughly translates as 'Devil Robot Combining Dinosaur'. Which is hilarious. 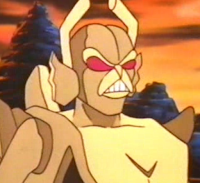 Jawbone is the leader of the Fossil Lords, and forms the head (if you can't work that out by the fact he has a gigantic head making up his torso). He also appeared in the 'Battle of the Rock Lords' movie in his prototype colours, where he was referred to as 'the Fossil Lord', leader of the Kingdom of Fossils. 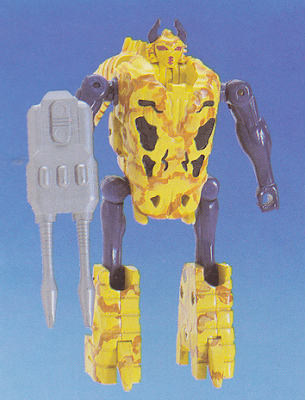 Apart from the colours, his cartoon design matches the toy almost exactly (albeit with a few more bones), indicating that despite the late release he was well underway in the design stages at the very start. Jawbone is a very striking deep purple. He doesn't have any secondary colours, but does have silver highlights on his head and torso-teeth and coloured eyes in red and yellow. While a bit more colour variation would have been nice, it seems to have been sacrificed for the cohesiveness of his transformation (the prototypes which have different colour arms and legs look very strange in combined mode). He looks a lot more like a traditional transformer than most of the Rock Lords, with arms that only barely reference his alternate mode, and big clumpy feet. It's a striking design though, thanks to his strange head and face on his torso. Of note is that unlike other Rock Lords, he doesn't have painted die-cast or screws, instead they are their natural colour. This may have been a cost cutting measure for the entire set, or due to the time it was released (in Japan it was released as part of the 'Machine Robo: Battle Hackers; series, which was the sequel to 'Machine Robo: Revenge of Cronos' where the original Rock Lords were released). Likewise his plastic is rather plain, unlike the sparkly or swirled plastic of most of the other Rock Lords. Jawbone's articulation is limited. He can tilt his head up and down and his arms will move at the shoulders, though thanks to the rivet-cylinder design they tend to feel quite loose. His legs move at the hips though the joints are connected so they'll only move together, and while it looks like he has knees, they only bend forwards. The gun helps to break up the colour, but the hands don't grip it that tightly. Originally, Jawbone was going to be released in colours that matched his movie appearance, with a much more skeletal vibe (fitting the name 'Fossil Lords'). Sadly the US release never occurred, and what was released in Europe was repackaged Japanese stock rather than a unique release. In some ways the prototype colours are more interesting in that they give the overall combined mode a unified scheme as well as more visual interest, but personally I like the bright purple look! The prototype had a hinged dinosaur jaw, fold out feet and smaller hands. The torso sculpt also seems different, but it is tricky to tell due to the paint work. Also of note is that his prototype weapon is completely different. Jawbone's weapon is a pale gold, and like all of the Fossil Lord weapons, quite big! All of the weapons have additional struts which look like they're meant to combine, but they don't. He doesn't hold his weapon particularly well, but it still suits him well. Jawbone's transformation is simple but effective - the hips move in and the legs fold in on themselves to form the back of the combined mode head. It all slots in quite solidly. Yes, there are hands hanging on the sides, but these actually have a rather neat purpose when it comes to combining him where they literally grab on to the Rock Lord below him! And yes, he... transforms into a head. Perhaps the most disappointing part of the Fossil Lords is that they don't have their own modes. When I first heard of them I assumed they had their own rock mode and also combined, but instead they just form parts of the final form. This is probably why the original US deco was bone-themed. As they were going to be packaged individually, transforming into a skull is more of an actual mode than a giant purple head. Of course, you'd still get some of the Fossil Lords who transform into legs or tails. I like the head design, but it is a shame that the mouth doesn't open as was evident on earlier prototypes. Jawbone is... well, he's unique. Objectively he has his issues, but he's still funky. The idea of a Rock Lord combiner is awesome, and even though he turns into a big purple head on his own, it's a memorable design and looks great on the shelf. He's probably my favourite of the Fossil Lords if you discount the combined mode.